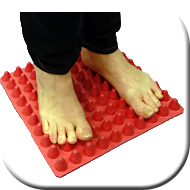 Daily stimulating the soles of the feet while walking on textured and spiky surfaces has been shownto improve your balance, coordination, and circulation. This is simple non-invasive way to improve your health and well being. Your feet contain the highest concentration of pressure and movement sensory organs in the body. They are within the fascia, musles, ligaments, tendons, skin - at depths of up to 2cm. Gravity is your friend here, and although walking on these surfaces can be mildly uncomfortable at first - you do get used to it. It rolls the concepts of foot reflexology and Shiatsu into a wonderful foot massage all in one! Studies have shown that a daily barefoot walk on this mat improves overall physical and mental well-being. Also assists with tactile defensiveness, discrimination, and perception, as well as tactile-proprioception.